Chiropractic care will improve your sporting performance no matter what level of sport you play whether it’s a better golf swing or more balance and coordination in boxing or martial arts. This is coupled with a decrease in your injury rate and a reduction in your injury healing time when you are injured. The following quote sums it up…..
Ac Milan are the current world and European club champions. In 1998 Dr. J.P. Meeserman (a chiropractor) was signed by Silvio Berlusconi who had been Dr Meeserman’s patient, by A.C Milan football club to turn around the clubs injury problems and improve the performance of the footballing staff. Dr Meeserman immediately implemented a non medical, chiropractic setup.The results he has been able to achieve have been nothing short of amazing. In his first year he reduced pharmaceutical use by 94% and in the same year reduced the injury rate at the club by a remarkable 90%. Because of the reduced injury rate the club was able to cut down to a playing squad of 23 players from 35. The benefits of chiropractic care have been able to extend many players careers and the average age of the squad is currently 29, the oldest in European professional football. Please click on the following link to read more information on AC Milan’s success with Chiropractic. Top Footballer Ruud Van Nistelrooy of Real Madrid and Holland has been under chiropractic care all of his career and has was treated at a chiropractic clinic in Manchester many times along with several other Manchester United players. 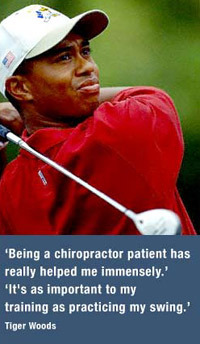 Arguably the greatest golfer the world of golf has ever seen has this to say on chiropractic…………………………………. ‘Being a chiropractic patient has really helped me immensely’. The only ever four time heavy weight champion of the world Evander never failed to see his chiropractor before a fight. ‘I found that going to a chiropractor helps my performance. Once I drove 20 miles to see a chiropractor before a fight. I must have my adjustment before I go into the ring’. 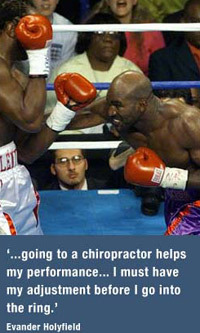 Many famous boxers over the years have utilised Chiropractic care to aid them in the ring! Former undisputed world heavy champion of the world, Lennox Lewis is one of many which also includes Muhammad Ali and Evander Holyfield, who won the world heavy weight title on three separate occasions, with the help of chiropractic care. Probably one of the most recognisable and famous sports stars in the world today. Lance won the Tour de France on seven consecutive occasions from 1999-2005. All this after recovering from testicular cancer that had spread to his lungs and brain. He needed brain and testicular surgery as well as extensive chemotherapy. 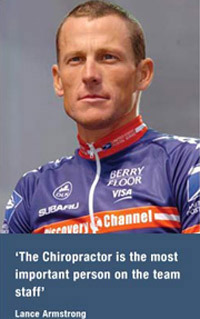 He says…”The Chiropractor is the most important person on the team staff” (every second counts). After his seventh and final victory he also said he could not have won without his chiropractor’s help.